Oud duo Ghassan Al-Youssef and Dina Abdel-Hamid are leading a performance for students of the oud class at the Talents Development Centre at Cairo's Opera House on Friday 14 September. The repertoire will include a selection of famous Arabic classics of Sayed Darwish, Farid El-Atrash, Mounir Mourad, Riad Al Sunbati, and other icons. The Egyptian couple is known for their joint performances, at times playing two ouds simultaneously and in other instances playing the same instrument at once, where Dina will play with the left hand and her husband Ghassan will play with the right hand. 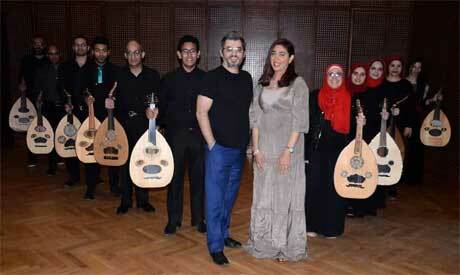 Both musicians are graduates of Naseer Shamma’s Beit Al Oud (the house of oud) in Cairo. They also have their own institution in New Cairo, the House of Music and Arts, where they teach oud to children and young people.